Some new affiliate marketing bloggers pump out poorly written content in their rush to get listed and ranked by the search engines. The sad result of bad writing is that their sites won't get listed, they won't get readers and they won't make sales. From the perspective of someone who understands English, would you ever visit this blog a second time as a ‘trusted source' of information? Note: I did a tiny bit of research to determine that this ‘blogger' (term used loosely) stole an article from another site and then ran it through an article spinner to generate the mess pictured above. As I said above, that was an extreme example of bad writing, but there are numerous other writing errors that can cause readers to cringe and refuse to return to our affiliate sites. Articles that are written to attract Google links, i.e. repeating keyword phrases in the title, description and text; sound completely ridiculous. Here is the example Google uses to illustrate what is known as ‘keyword stuffing'. You may laugh at the notion that anyone would actually write, let alone publish, an article containing a paragraph that sounds so bizarre, but the web is loaded with them. Fortunately for readers, Google de-lists sites that attempt to manipulate search engine rankings in this manner. Google will show its appreciation for your site when you attract new and repeat visitors through well-written and informative articles. There is no excuse for spelling errors, especially when you are writing on a computer. Word has a built-in spell checker and if you don't use Word, then avail yourself of software that will check both your spelling and grammar. Knowing how to spell doesn't mean my typing is always perfect, though, and goodness knows that my grammar is often far from perfect. Check out this list of words that make bloggers seem dumb. Your spelling and grammar might be perfect, but if there is only one block of text or each sentence constitutes a paragraph, you'll lose readers by the second or third line of your post. Make your whole article easier to read by adding subheadings, numbered bullet points or both, as I've done with this article. The surest sign of a poorly written (and probably fake) product review is one that is loaded with superlatives praising the product. Some examples of these are best, amazing, quickest, richest, etc. No product is perfect and a well-written review will reflect its downfalls as well as its advantages. Don't try to write like someone you're not. You don't want to come off sounding pretentious. If you wouldn't normally use a certain word during a conversation with a friend, then avoid using it when you are writing for your blog. If you are new to writing for public consumption and worry about how people will receive your work, the best advice I can offer to end up with writing that sounds natural is to write like you speak. I sometimes use Dragon NaturallySpeaking software when my head is bursting with things I want to say in an article. With the program open, I just rattle away until I've said everything I want to say (or can remember at the time). I smooth out the rough edges later to make the writing ‘sound right'. I am guilty of failing to proofread on far too many occasions and then cringing when I re-read my own published posts! Spelling and grammar checkers won't guarantee that your blog post adheres to the 5 C's of copy editing, i.e. that the writing is clear, correct, concise, comprehensible, and consistent. Therefore, before you publish, read your article through to make sure it conveys the message you want to get across clearly. Better yet, ask someone to review and provide feedback about your blog post. Communicating well lies at the heart of what we do as affiliate marketing bloggers. Your objective while writing a review should be to completely satisfy your readers' desire to know how the product you are promoting will fill their needs — honestly, and in a manner that is easy and enjoyable to read. 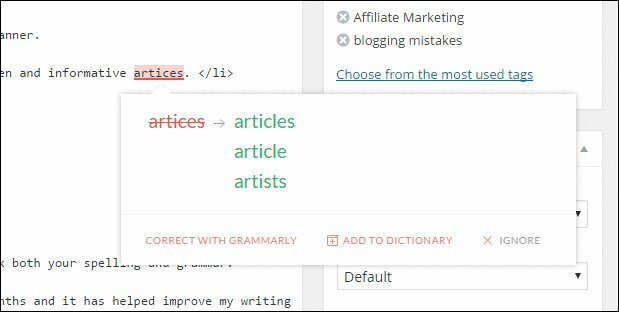 Grammarly – grammar and spelling checker. Dragon NaturallySpeaking – speech recognition software. Eats, Shoots & Leaves: The Zero Tolerance Approach to Punctuation – best-selling book about punctuation. The Elements of Style – the classic style manual by Strunk & White. Did you find this post about how bad writing kills sales informative and useful? If so, please share it with others! If you have a comment, question or suggestion, please post it below! I forgot to mention a voice-to-text app from Google that some may find useful. It is called VoiceNote II. It works fine for me, and is free (yay!). I speak at a regular pace and it is pretty accurate. I do find that the microphone makes a big difference. I could not use the built-in mic on my pc. I had to use an external headphone with a boom mic, which worked well. Thank you for your articles about blogging mistakes. I am thinking about entering this business, and have been reading first to understand it better. Your articles are a big help. Thank you! Nice article Rosalind. There are certainly some good points to be taken from it. Thanks Eddie.. glad you liked it! i really wish that i had done better at the time.However that was the 1960s and Affiliate Marketing didn’t exist then.Come to think of it neither did computers.Anyway,if you want to make money ,you just have to do it right.Thanks. Great write-up, I got so many things to be corrected fully discovered after reading this. Hi Anna — glad you found the article helpful! You’ve put me in the doghouse on your posts so far. Completely guilty of too many blogs (177 at one point), bad niche issues (not narrow enough), and don’t get me started on the gutter grammar! Then, there, is, the, perpetual flagellation from the GP over my abuse of commas. Comma-tose! Pro-comma! I guess I should have a look at investing in that Grammarly. I wonder if they have a voiceover one? Maybe with a 7 sec delay… Like they have on the news? Of course if I suddenly start to sound intelligent people might expect I look the part too. OMG!